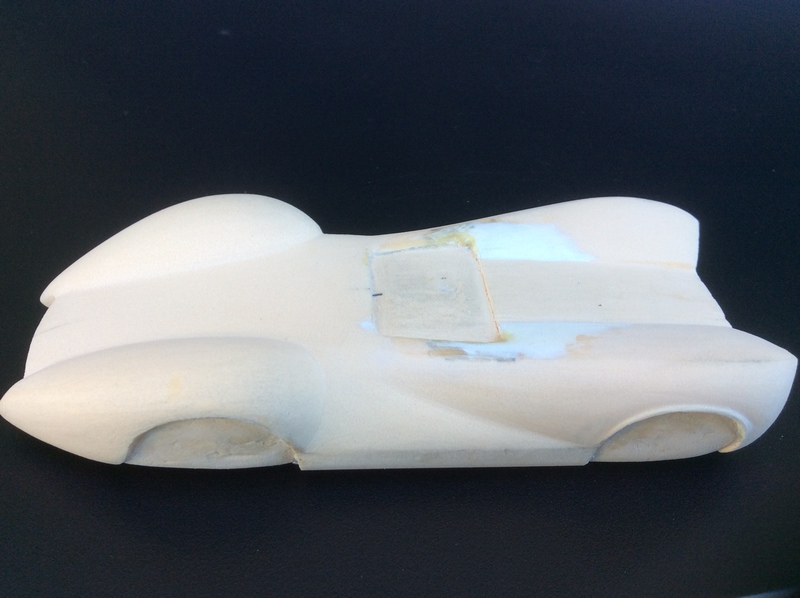 Here's the start of carving my entry for the proposed 1966 Can-Am proxy series. 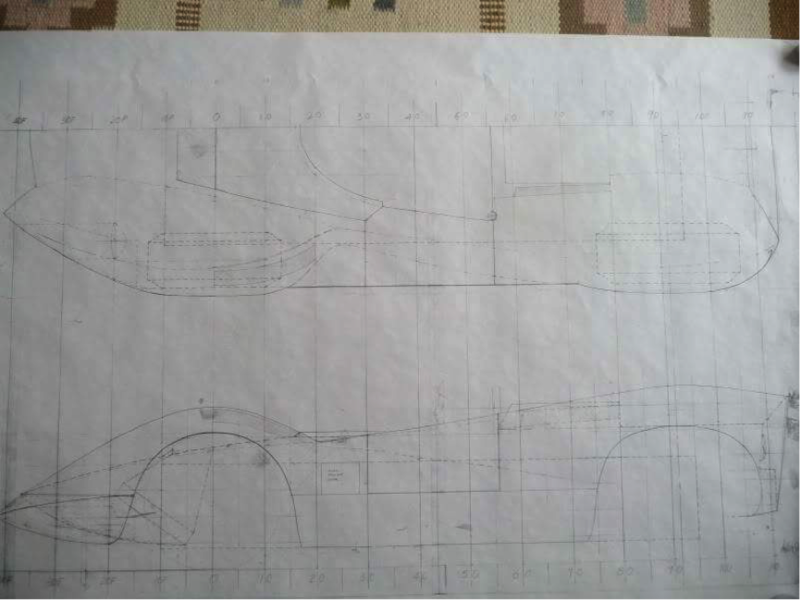 I have been very lucky to have been sent photographs of the plans of the Wolverine by Joel LeNoir who in turn had acquired them from recent owner Mogens Christensen; many thanks Joel. 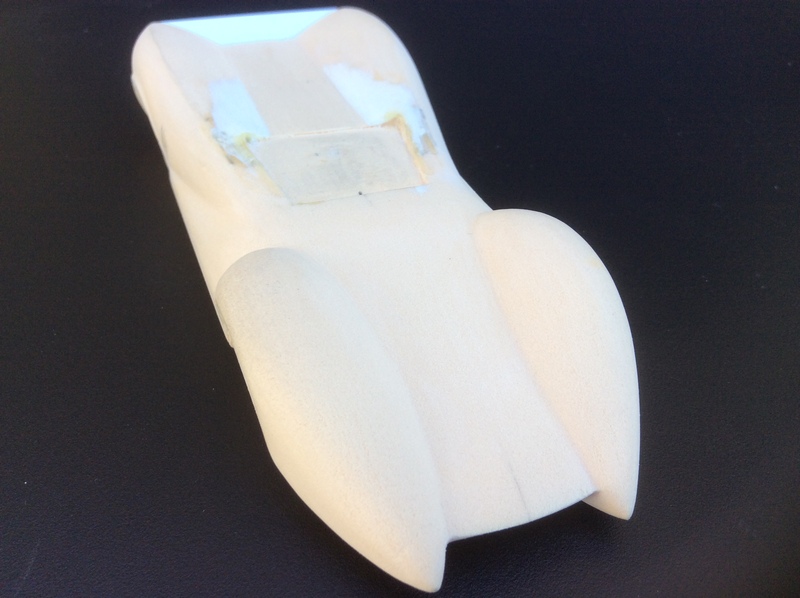 The plans scale to 74mm wheelbase and 56mm wide. 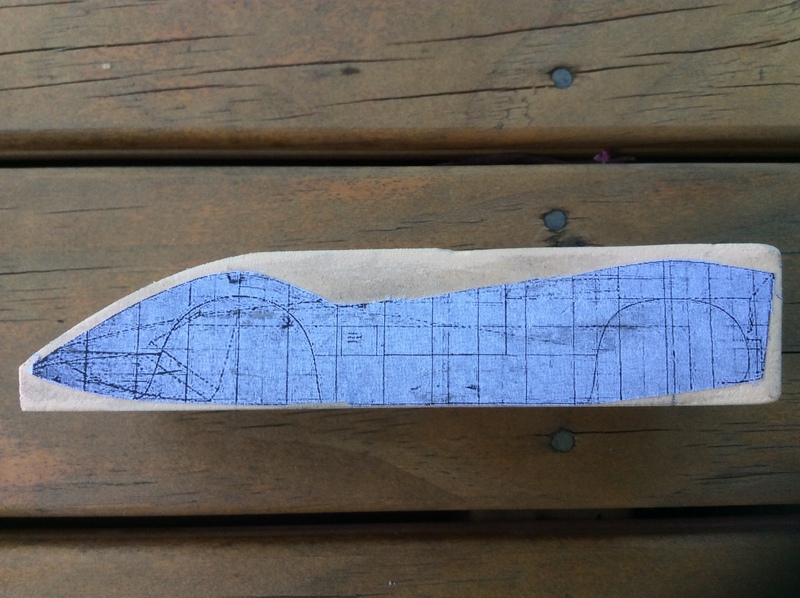 The Wolverine is not going to be the easiest to carve as there are compound curves and the tail is very concave. 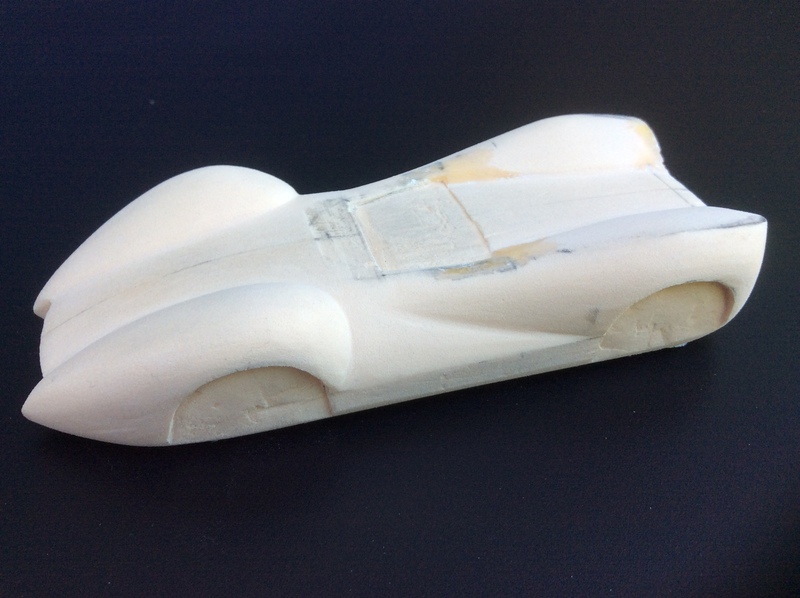 As a sports car carving novice (single seaters are easy!!) its going to be a big challenge to get it right. I'll attempt to show progress unless it gets embarrassing! 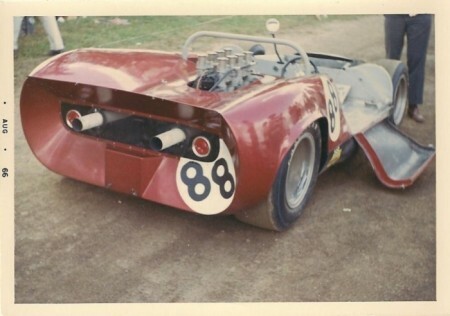 As for the real Wolverine it was quite successful in SCCA events but much less so in Can-Am. In fact it only raced once at Mont Tremblant, St Jovite starting 25th and finishing 20th. 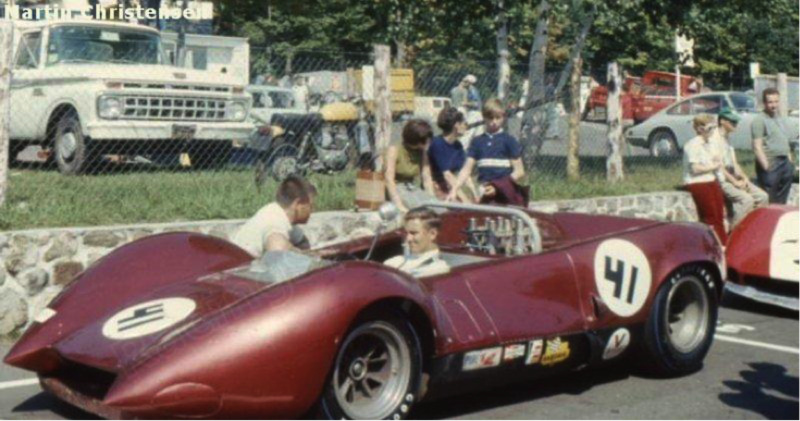 Jerry Hansen, an amateur driver and businessman, had commissioned the car in 1965 from GM race car designer Lee Dykstra and coachbuilder George Anderson. The car was given a steel tubular space frame chassis with stressed aluminum honeycomb sheets resulting in a semi-monocoque. The rear suspension was comprised of reversed lower wishbones, twin radius arms, and top links. The front was suspended in place by double wishbones. Mounted mid-ship was a Chevrolet small block V8 engine mated to a McKee quick-shift, four-speed gearbox. Magnesium wheels were placed at all four corners. The design was said to have resembled the claws of a Wolverine, hence the name. 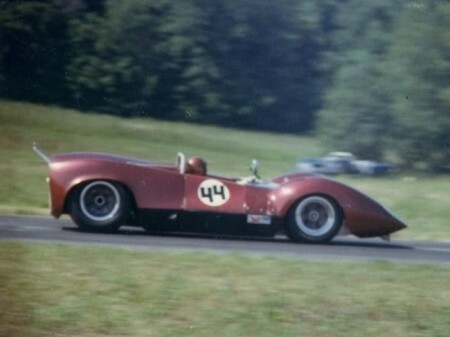 The story goes that the car only raced once in Can-Am because of a fatal race accident to a close friend of Hansen shortly after the St Jovite race; he sold the car and bought a McLaren for 1967. The Wolverine raced up until 1972 and has been entered in recent historic event including at Goodwood. At a previous event showing that concave tail panel. Now I remember where my copy of the plans came from. I started crying this one but got shelved. Thanks for the offer but John Warren has already agreed to mould and cast it for me if the carving is anything like the original. I also promised Joel a body if it works out. How far did you get with your carving? Have you got a plan for the frontal view - Joel wasn't able to find that? That is good as long as Joel gets a body. I will sort thru my drawings. II only cut out the basic shape on the band saw before getting side tracked on some other project! Thanks Phil - I've sent you a personal message. The combination of David, original plans and a relatively little known car promises for an interesting thread here. Well done David! This is a very interesting although I wouldn’t call it a pretty car. I‘m looking forward to this build and how you realize the technical part. Thank you for the comments chaps. 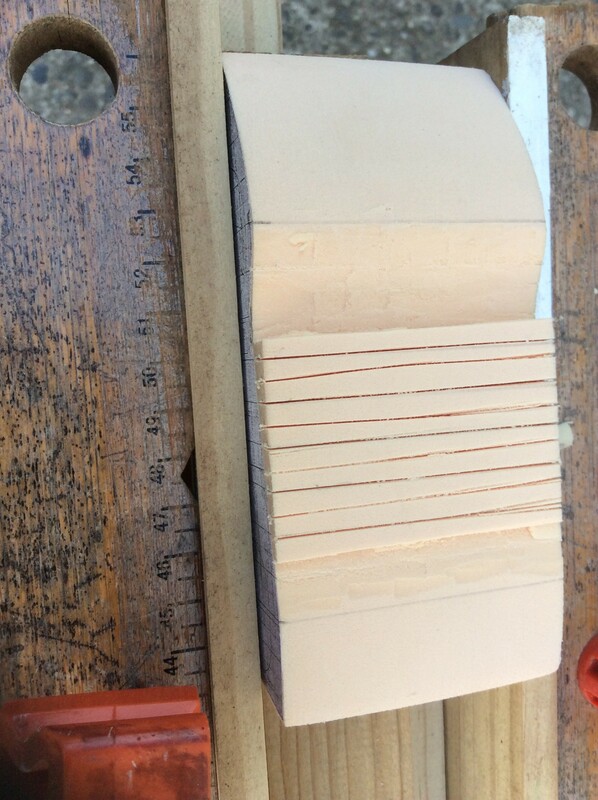 I've made some more progress today and have begun to fully realise what a difficult subject I've chosen to carve. There is hardly a panel which is not curved and the sides between the wheel arches have a unusual shape to say the least. However I'm enjoying the challenge. Below are some pictures to illustrate how I'm proceeding. 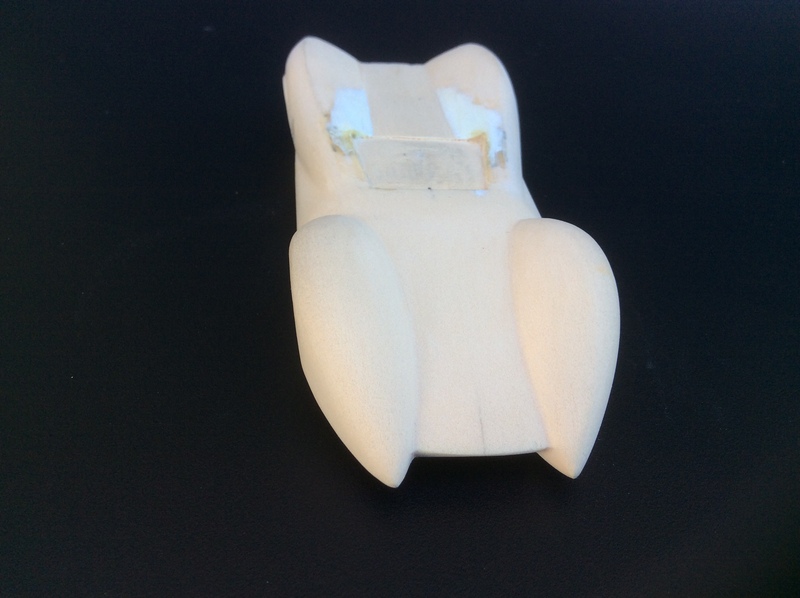 I started by shaping the side profile of the car by sawing the block roughly to shape, carving out the top surface and sanding it to more or less the finished dimensions. 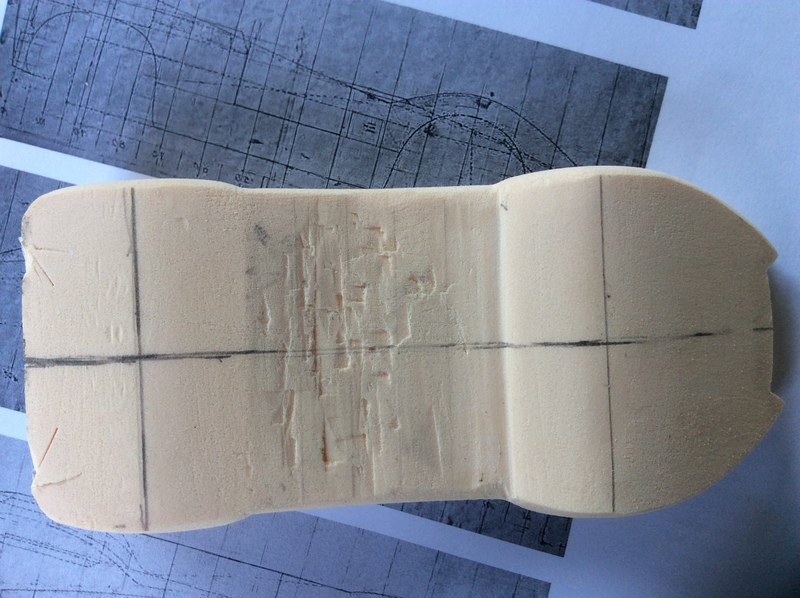 Then I worked on the plan view by positioning the top view plan on the underside of the block (top surfaces having been shaped is no good for this) and carving and sanding to almost the finished shape. This evening I've marked out the shape of the upper body and roughly carved out the rear deck between the arches and the same for the front. All the way through I've been making sure the centre line and axle positions are clearly marked and square - or at least I hope I have. The next stage is sanding the wings to shape and figuring out how to achieve the right form for the side panels. David, it's very interesting to view your process. I'm happy to see that you seem to have sourced a full set of carving tools while in far-off New Zealand. I came here prepared and Fiona (my daughter) has a workshop for her jewellery making which has many useful tools. However I did have to acquire a bigger piece of tooling board from John Warren as I only had pieces suitable for single seaters with me. A very interesting project with a difficult form to master. Looking forward to seeing your work progress. I've been able to spend a few hours on the Wolverine in the past two days partly because the weather is so hot here that sitting in the shade carving and sanding is about the most exercise a sensible person should take. The overall shape is coming together well I think and side panels have bee easier to replicate than I thought they would be. On or two small errors along the way but these have been easily rectified with filler. What a piece of art! It may not seem like it from the pictures below but quite a lot more work has gone into the Wolverine carving. The front wings have been slightly re-shaped and reduced in size and the area between them has been increased in depth. The rear wings have been slightly re-profiled. Underneath the nose has been angled more or less to shape. I stopped prevaricating and tackled the concave tail. To do this I glued the shape of the tail, from the plan, onto back of the carving and used a thin chisel blade to cut downwards from the top of the rear deck to form the opening for the exhausts. 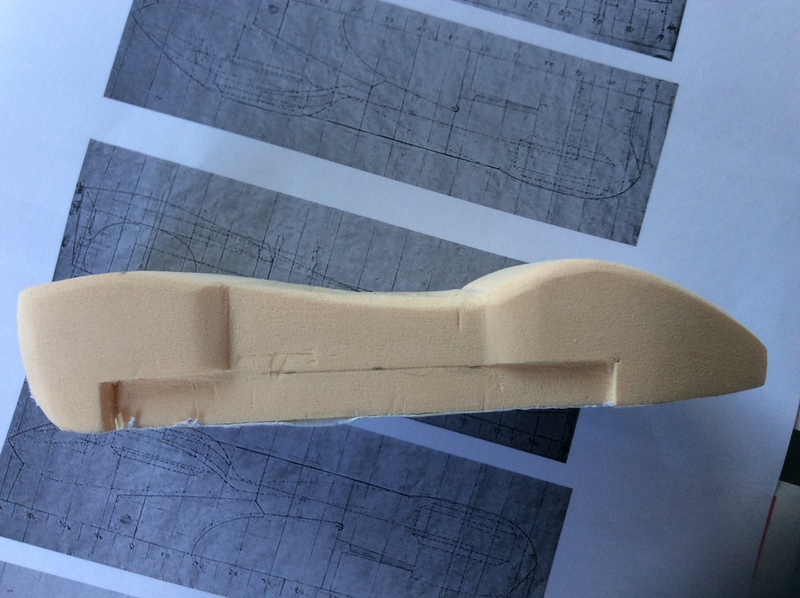 Once this was shaped and cut to the right depth I used a wider chisel blade to carve out the tail panel at an angle. I surprised myself as this was much easier to do than I expected. 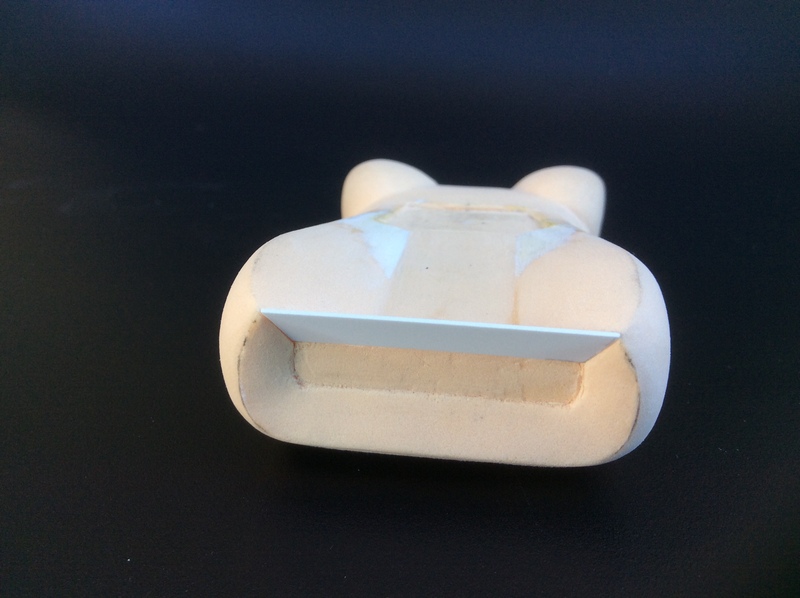 Once the bulk of the material had been removed it was then down to sanding to the final shape. 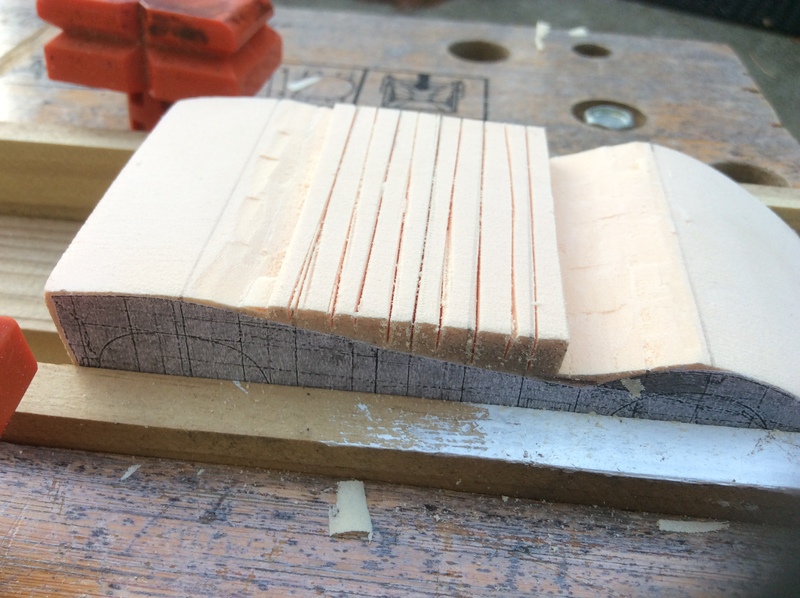 I use wet and dry paper of various grades glued to different shapes of wood for sanding; the variously shaped wooden moldings to be found in DIY stores are most useful for this. To complete the tail panel and close the opening at the rear of the upper wings I cut a piece of styrene to shape and carefully trimmed it and the opening to get a good fit. 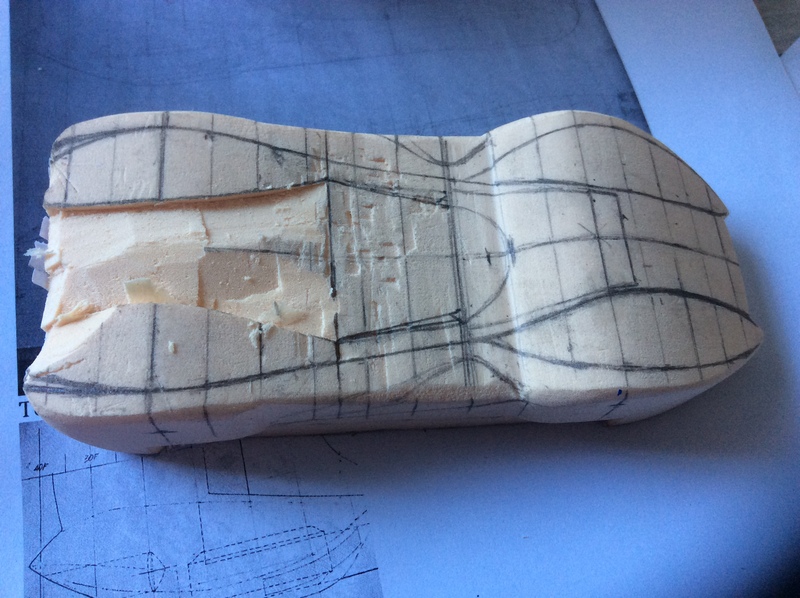 This will be glued in place once I’m completely happy with the shape of the rear wings and deck. The final task today was to shape the lips above the rear wheel arches which again turned out to be easier than anticipated. The next tasks are to; fully shape the cockpit area; cut out an indentation for the injection stacks; scribe the panel lines; give a light finishing sanding all over the body; and spray paint it in primer which will no doubt reveal some blemishes for correction and another coat of primer. Wow! You took another step forward and a level upwards with that carving. Are you going to finalize this build on this model? 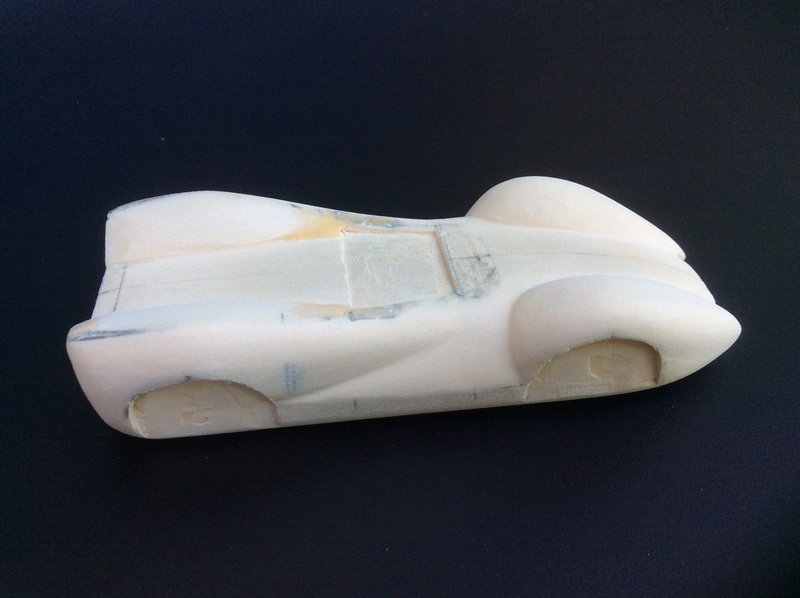 I'm planning to work out only the rough shape of the body with the first generation foam piece and do all the detail work on a second generation resin shell. 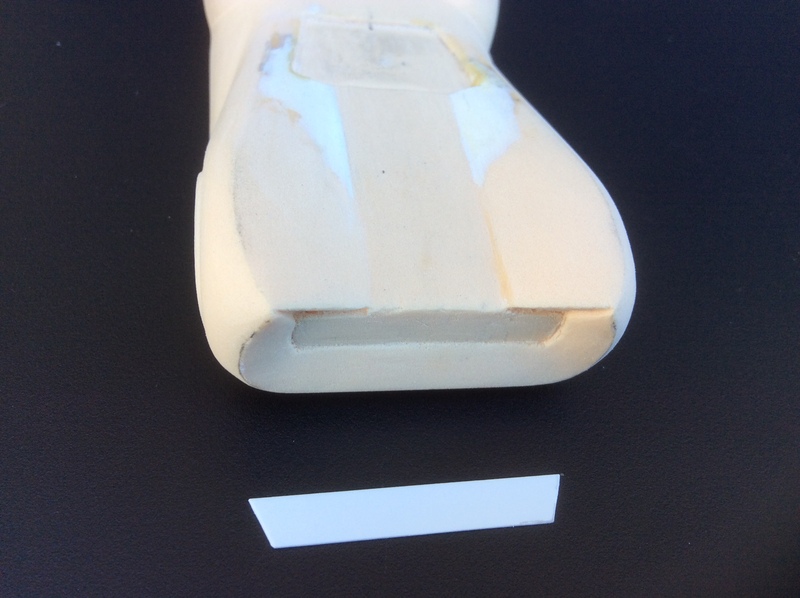 In general I don't find it easy to carve on a mixed filler and foam surface because of the significant difference in hardness with the low density foam. I have also pieces of higher density foam with wood like hardness but haven't it tested yet.